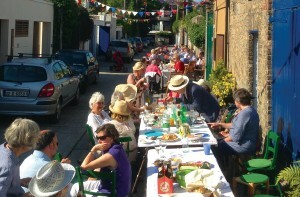 Sunday 22nd June saw the residents of Heytesbury Lane in Ballsbridge throw a street party. It has been an annual event for over 30 years and many of the residents who were there have been attending since it started all those years ago. Bunting was hung from lamp post to lamp post along one end of the narrow lane; various flags used to feature but only the Tri-Colour has withstood the test of time. The bunting was stitched together by the residents 25 years ago out of old clothes belonging to their children, many of whom were there and quite a few of them recognised scraps of fabric from favourite dresses or tee shirts. The festivities kicked off mid-afternoon, and by four o’clock the barbeques were fired up and in use, filling the lane that runs in between Wellington and Waterloo Road with delicious cooking smells and the chatter of those hungrily waiting for the cooks to dish it out. A steady flow of people from the area came by to have a snack and a drink and meet new neighbours and old friends. Wine and beer flowed freely well into the evening and then into the small hours. Shortly before midnight, Donnybrook Gardai even came by, not to clear the street but to stop, chat and pose for photographs with some of the revellers.